Welcome to the website of the Ailsa Craig Highland Dancers. Inside this site you can find a variety of information on the dance group including a selection of photos and video of the dancers in performance. The Ailsa Craig Highland Dancers, under the tuition of Aileen Robertson, was established in 2007 and have performed at a variety of international events in recent years. In 2007 the group had the honour of representing Scotland at the Virginia International Tattoo held in Norfolk, Virginia performing with the Scottish Dance Theatre of Virginia and the Massed Pipes and Drums of the Canadian Forces. The Group returned to the event in 2010 and on this occasion were joined by the Schiehallion Dancers based in Hamilton, Ontario. 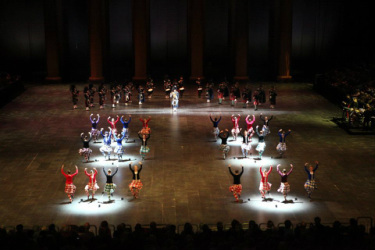 In July 2010 seven dancers joined the Rhythm of Africa dancers, based in South Africa, at the Basel Tattoo in Switzerland performing with the Swiss Army Concert Band and piper Stuart Samson. The group also performed at a promotional event in Heraklion on the Greek Island of Crete in September 2010, working with Paris Port Dover Pipe Band, Symphonic Brass Wales and the Heraklion Philharmonic Orchestra. The event also provided the opportunity for the dancers to learn some traditional Greek dancing and perform alongside the Cretan dancers in the show finale. In April 2011 Aileen was appointed Dance Director for the first ever Las Vegas International Tattoo, choreographing the Ailsa Craig Broadswords for an International team of dancers from Scotland, Canada & the United States. The dance was accompanied by the Pipes & Drums 1st Battalion Scots Guards led by Pipe Major Brian Heriot who was born in Girvan. The Tattoo held in the famous 10,000 seat Thomas & Mack Arena was held in conjunction with a two day Highland Games. The Ailsa Craig Highland Dancers returned to the Virginia International Tattoo in April 2011 and returned to Crete in September, performing at the first International Mediterranean Festival of Arts. In November 2011 the group were invited to perform at the Berlin Tattoo, held in the O2 Arena for the first time. The show also included Impressive acts such as the world renowned Top Secret Drum Corps, The Band of Her Majesty's Royal Marines, Vancouver Police Pipe Band and the Cape Town Highlanders. During 2012 the Group returned to Switzerland, performing alongside Stuart Samson MBE and Skip Healy at the Basel Tattoo and also at the Berlin Tattoo in Germany. In 2013, representatives from the team were selected to perform as part of an International Dance Team at the Basel Tattoo in July with Aileen joining the girls as assistant Dance Director and in November the whole team performed once again at the Berlin Tattoo. During December it was a privilege to be part of the first Christmas Tattoo which took place in both Basel and Zurich, performing with the National Youth Pipe Band of Scotland. The dancers returned to Basel in December 2014 to perform again at the Christmas Tattoo before again participating in the Basel Tattoo in July 2015. Additionally, many of the Ailsa Craig Highland Dancers have performed in the Royal Edinburgh Military Tattoo since Aileen was appointed Dance Director. A number of them were lucky enough to travel to Australia and New Zealand with Aileen in February 2016 to perform with the Royal Edinburgh Military Tattoo Highland Dance team in Melbourne and Wellington.